In a previous post, I mentioned the dangers associated with working in the southern Colorado coal mines during the early 1900s’s (Colorado Coal Mine Dangers). Hundreds of men were killed aboveground and underground, including my grandfather’s brother and three of my grandmother’s brothers. All four are buried at Catholic Cemetery, Trinidad, Colorado. During my research, I found that one of the Family History Library microfilms has a pencil drawing of plots and names from that era (Film number 002786, section 1) plus records of internment which give the cause of death and burial location. Scanning the names on the the plot maps and burial records, you will find many names of emigrants from Trentino, a large number of whom are listed as dying due to mine accidents. 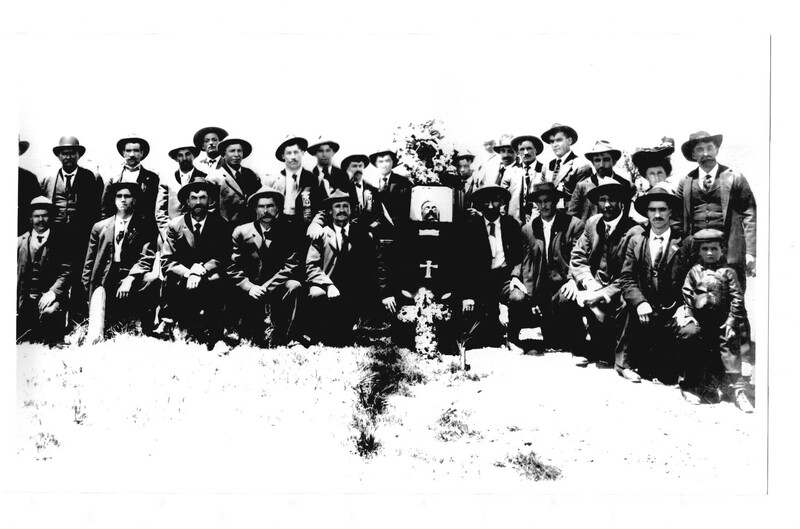 The photo below (somewhat unsettling) shows the November 1906 graveside services for the burial of Francesco Iob. There are many people in the photo, many of whom (most?) are likely from Trentino. Our ancestors kept close ties to each other at the mines due to culture and language. If you click on the photo, a larger version will be available. If you can identify anyone in the photo, please let me know (I have been told that the man standing on the right is Pietro Moltrer; next to him is my grandmother and kneeling in front of her is my grandfather). This photo was provided to me by a relative in Trentino — which shows the importance of trying to locate living relatives from your ancestral village. Additionally, by monitoring the genealogy bulletin boards on the internet, you can make many contacts with others sharing similar interests in Trentino. By helping them, you will often receive help in return (a fact, a story, a link to others, etc) — that is one method which proved fruitful to me many times over. Yes, you will likely provide more help to others than you receive, but that is part of the fun in genealogy — more fun is suddenly receiving an email with information you did not know existed. This entry was posted in Colorado mines, History and tagged family history, Hastings, Trinidad Colorado. Bookmark the permalink. I’m almost certain, the second kneeling man to the right, is my great grandfather, Fortunato “Frank” Pedron. The family resemblence is shocking even to me. The first kneeling man (next to the boy) is my grandfather. Do you have any info about your gff? Pedron is common in the villages of Terres, Flavon, and Cunevo, which next to each other. I have an enlarged copy of the photo – if you have a photo of your ggf I may be able to make a comparison. You can email to me if you don’t want to post it. I don’t have a photo on hand, but I’ll get one from my father. Fortunato came to the Trinidad area in 1895, worked as a coal miner with his older brother Bortolo, and homesteaded a ranch near the Spanish Peaks in the early 1900’s, that continued until after he died in the 50’s. Both my grandparents were born and married in the area, and I visited many times as a child. I’ll see if my dad can fumble his way through running a scanner to email me a photo of Frank. No joke, the man in the pic looks *just* like my dad at that age. Hello, I’ve got my 79 year old, technology challenged Dad trying to scan pics from my grandmother’s photo albums and send them to me. No guarantees how that will come out. Anyway, the kneeling man second to the right of the casket, I’m 99% sure is my great grandfather, Fortunato “Frank” Pedron. The family resemblence really is uncanny. Now I wish I had copies of family pics here with me! Frank and brother Bortolo arrived in Huerfano county CO in 1894 from Grauno. Both made a few return trips to Italy to visit family etc, and in 1900 Frank married Angela Cristofori, who was escorted to Trinidad by Bortolo, along with their sister Margherita, who married her fiancee, Archangelo Nardin, on the same day Frank married Angela. Frank became a naturalized citizen in 1906, and fathered my grandpa, Albert, in 1908. All the old timers in the family always said my Dad was the spitting image of Frank, so until I can get a photo of younger age Frank, here’s a couple of my Dad from the 50’s. my name is Ciaghi Manuela and I live in Northern Italy near Trento. I write these few words to let you know my experience. I was in Colorado in 2011 and this year 2014 to partecipate in the annual commemoration of the Ludlow Massacre. In that occasion, I visited the mining site of Hastings where my grandfather John Ciaghi worked for many years. You can still visit the coke-ovens and a small part of the mine, even though it is unsafe and dangerous. This year, the United Mine Workers of America have celebrated the centennial of the Ludlow Massacre and the commemoration, which I attended, was particularly interesting. I had the opportunity to meet the families of some of the victims of the massacre as the Petrucci’s family and two cousins of ​​Louis Tikas with whom I keep costantly in touch. I can say that most of the people I met in Trinidad and surroundings area, are of Italian origin, and during my visit to the Catholic Cemetery I could notice that many headstones bring Italian surnames. I had a memorable opportunity and also the feeling of walking on the same path of my grandfather. My great grandfather Angelo Greco was a miner there at 18 years old in 1906 and my grandmother was born in Hastings, My great grandmother divorced and remarried a man named Steve Pappas from Greece I noticed there were several Pappas that died in the 1917 coal mine disaster . He was not one of them but I wondered if they were related. Hi there ! I’m Annalisa, live in Trentino (Italy) 😉 My grandpa John Ciaghi lived right there in Hastings, Colorado for many years, before coming back to Italy. He leaded a general store at the beginning of one of the coal mines. He had three sons and came back home, here in Trentino, in 1926 cause his first wife died in childbirth of the fourth baby.Then he get married again and my daddy was born 😉 I went there 4-5 years ago, in Colorado, in the same place where my grandpa had his store (and home): only the front wall is still standing, for the rest … desert total. But was a great emotion.. and visited also the cristian cemetery in Trinidad, where his first wife is resting. He had bought a piece of lawn rather large, for himself and for his children, but was not able to do it all alone with three small children, so he returned to Italy. But seeing her name written on the stone engraved with the year of birth … and the year of his death in 1949, his sons have made from Italy, it was really strong emotion! We cousins ​​we have done many many searches on the permanence of our grandpa in the United States and especially in Hastings, and a master’s thesis was made ​​by taking its cue from his history as an immigrant during the phenomenon o the immigration of Trentino after the First World War.